A Lexington couple was prepared for a big project, but cosmetic fixes did the trick. 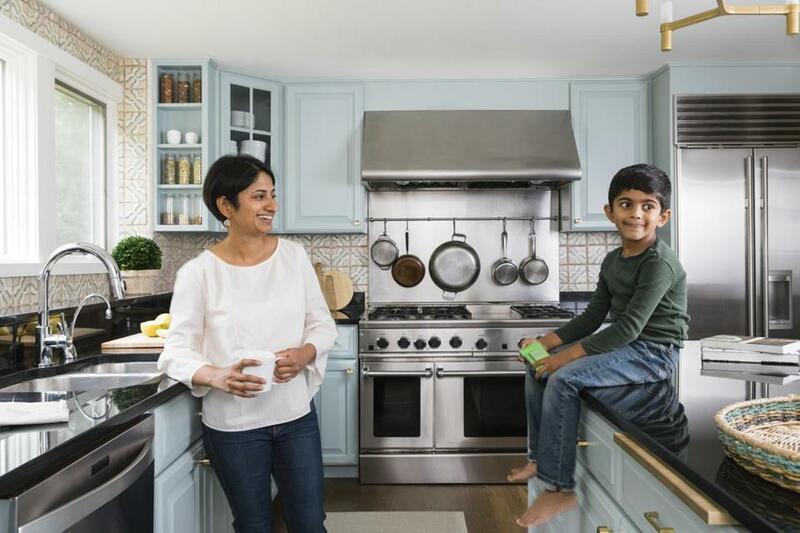 Priya Parasuraman and son Vihan relax in their reinvented kitchen. The backsplash tile reaches to the ceiling, bringing pattern to the entire wall. Roisin Giese and Miggy Mason designed the open spice shelf to fill an empty strip of wall, a custom touch that looks original. Starting from scratch isn’t always essential. 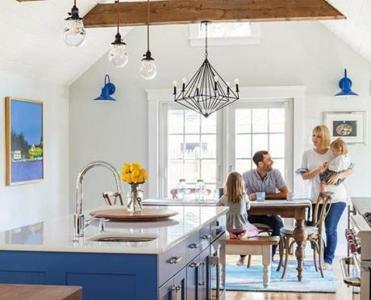 When homeowners Priya Parasuraman and Sanjeev Kalyanaraman contemplated renovating the kitchen in their recently purchased Lexington home, they were prepared to submit to a total gut. Roisin Giese and Miggy Mason, the duo behind South End design studio Twelve Chairs, had other ideas. The homeowners’ chief complaint was the room’s dreariness — sage green walls, outdated cherry cabinets, polished black granite countertops. “It was such a dark, depressing space,” Parasuraman says. But the layout worked well, and the appliances were top of the line. The flaws were nothing paint, tile, and creativity couldn’t remedy. The couple felt drawn to Giese and Mason’s vibrant designs: “Theirs was one of the few firms we saw on Houzz that used color,” Parasuraman says. They didn’t just want to brighten the space — they wanted it to be cheerful and colorful, and to reflect their Indian heritage as well as the home’s quintessentially New England location. A typical all-white kitchen wasn’t going to cut it. To set the stage, Giese and Mason cleaned up the shell. They chose Benjamin Moore Dove Wing, a soft off-white, for the walls. The red-tinged natural oak floorboards were refinished with a medium-brown stain that grounded the space. Their two-bedroom house in Wellesley Farms was way too small for their growing family. Adding 725 square feet solved all their problems beautifully. Using blue as a touch point, the designers amassed fabric and tile samples to flesh out the color story. The terra-cotta backsplash tile by Tabarka Studio was a particular favorite; its edges remind Parasuraman of the red oxide tiles used on floors in south Indian manor homes. “Once they showed me this, there was no going back,” she says. Twelve Chairs worked with Excel Painting to refinish the existing cherry cabinetry in Benjamin Moore Wedgewood Gray, which pairs beautifully with the black countertops. 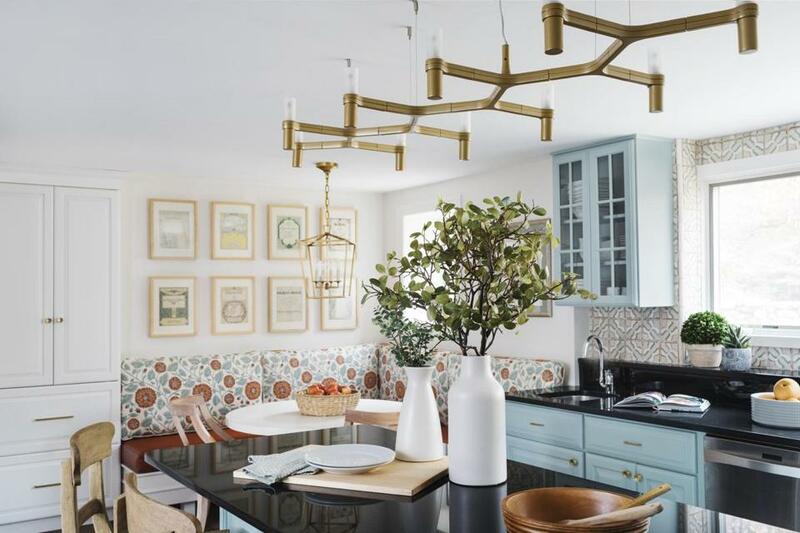 Swapping out the old hardware with aged-brass knobs and pulls from Schoolhouse Electric added a fresh, on-trend element that works with the home’s modern lines. Beyond the island, Giese and Mason replaced an underused desk with multifunctional floor-to-ceiling pantry cabinets. The built-ins house small appliances, including the microwave. (A new bank of drawers occupies the space in the island that originally held the microwave.) The pantry doors retract and the bottom shelf pulls out, acting as a tea-serving station from which guests can easily help themselves. A dead space in the corner became a lively breakfast nook. While the homeowners had thought about breaking through the wall to the outdoor patio, the team ultimately decided that the space was better used for seating. 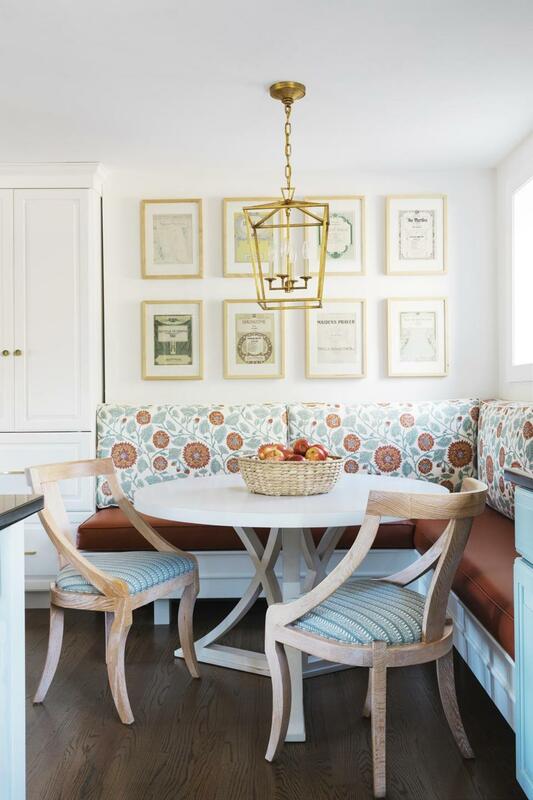 Jaipur printed linen by Peter Fasano, an Indian-inspired floral that complements the backsplash, covers the back cushions of the banquette, and the seat cushions are upholstered in easy-wipe terra-cotta-colored faux leather. The small-scale Schumacher stripe used on the Serena & Lily chairs adds another layer of pattern and color, and the gilded-iron lantern pendant light from Visual Comfort echoes the hardware, with a bit more shine. The weathered oak island stools, from Restoration Hardware, are similar to the chairs at the banquette in finish and profile. In the corner, rather than relocate an existing radiator, the banquette was raised to allow heat through. The sloping X base of the Redford House dining table allows room for sliding in and out easily. Marni Elyse Katz is a regular contributor to the Globe Magazine. Send comments to magazine@globe.com. Follow us on Twitter @BostonGlobeMag.